Australian Broadcasting Corporation. 1986. Producer: Kris Noble. 45 (OP) ABC Records. K-295. 1987. Side a: "Degeneration - Dance Mix". Nick Bufalo & Skippys Burial. (Composed by Bufalo, Denton, Debano). (MCA Gilbey). 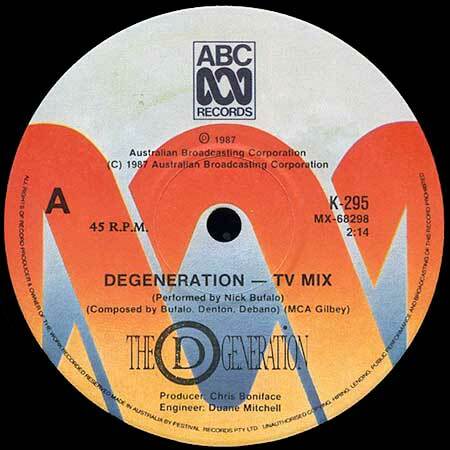 Side b: "Degeneration - TV Mix". Nick Bufalo & Skippys Burial. (Composed by Bufalo, Denton, Debano). (MCA Gilbey). 45 (OP) Mushroom. K1016. 1989. 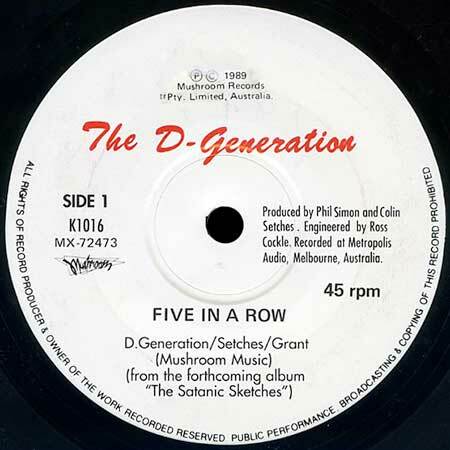 Side a: "Five in a Row". D.Generation / Setches / Grant (Mushroom Music). Side b: "Pissweak Quiz Show Sketch". Treditional. (Mushroom Music).